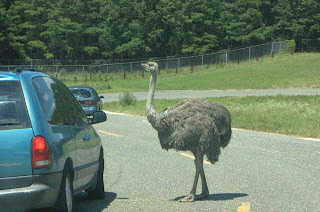 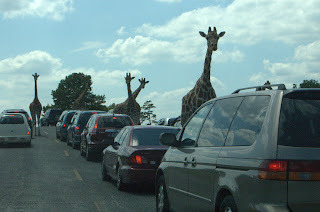 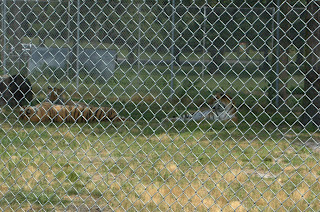 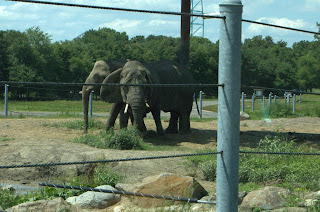 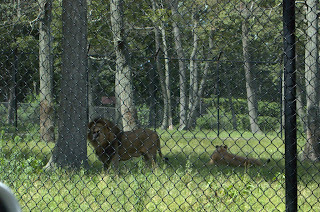 Two weeks ago on a Saturday, we decided to visit the Six Flags Animal Safari in New Jersey with our friends. 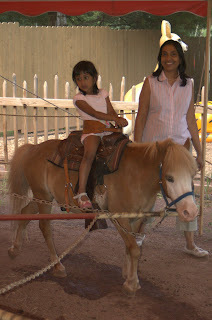 We hadn't taken our daughter out much since I started recovering from surgery. 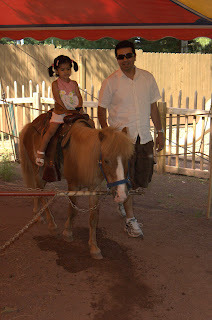 It was a 3 hour drive to get there from Westchester, NY thanks to the heavy traffic. 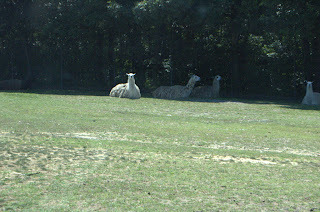 We parked at the rest area which has decent amenities. 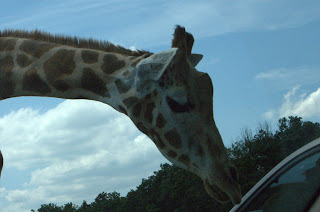 I would strongly recommend that you take your own food and beverages as the cost is exorbitant inside. 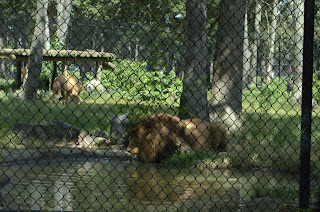 For example a small bottle of water cost my friend Nakul $3.30, and a diet coke $3.75. 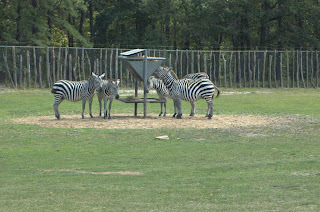 After lunch, we started off on the safari, not really knowing what to expect. 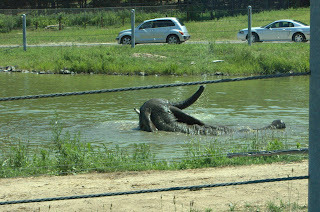 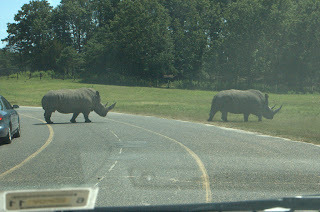 It turned out to be a good experience to watch from inside your car, as the animals roamed around freely, especially the giraffes that were literally walking over the vehicles inspecting the occupants through the sunroofs or the windows; the lazy elephants taking a bath in the hot afternoon; 3 rhinos crossing the street in front of us in a parade; and of course the 'we could care less' lions and tigers. 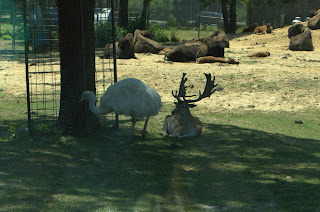 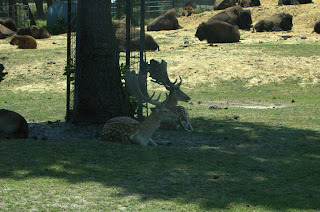 Then there were the other usual suspects - zebras, ostriches (too many of them), deers, kangaroos, bears, baboons by the hundreds, and many other animals whose names I can't even remember. 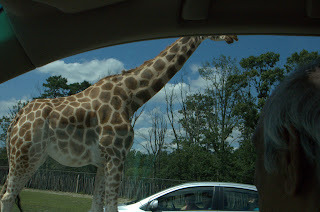 My daughter Tvisha and her friend Kharan had a great time looking at the animals, fighting amongst themselves at times to find the best spot in the car. 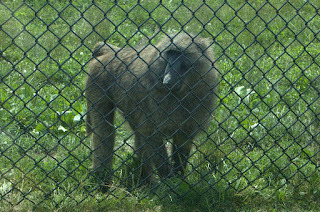 Both of them were also really intrigued as to why the baboon's derriere was red in color. 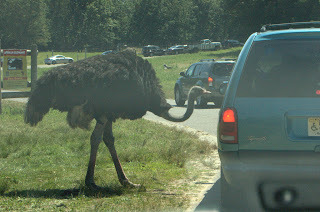 I of course took the fifth on answering that one :-). 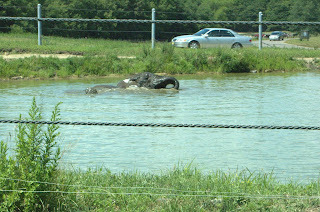 The whole viewing time is around 1 hour and we were back to the rest area where we had parked previously. 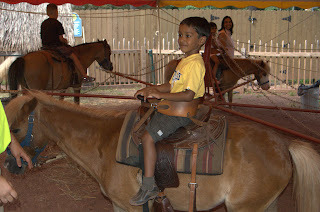 The kids Tvisha, Kharan and Sahana all enjoyed a pony ride, while I was ready to get out of there contemplating with submission how bad the drive back was going to be. 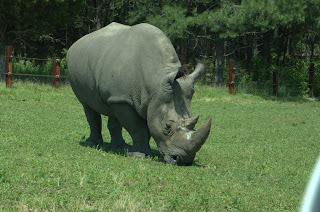 To summarize, it was a good outing if you can bear the heat and the I-95 traffic, and the pricing of the event ($20 bucks a person, which with 5-6 people in a car adds up real fast). 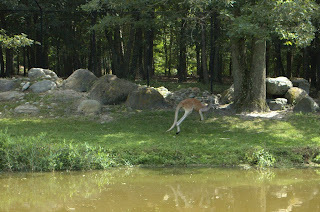 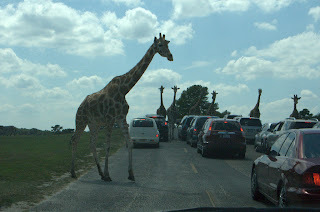 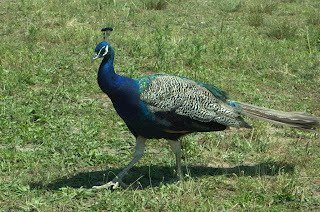 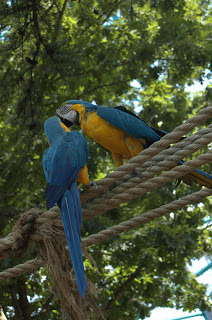 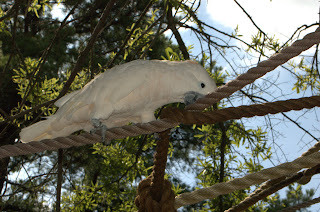 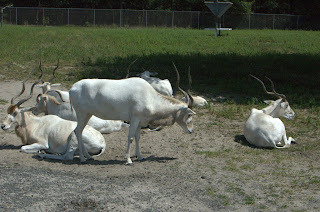 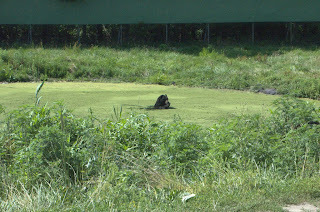 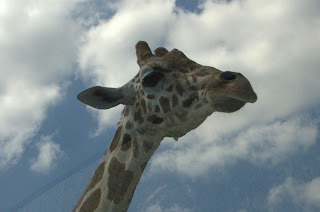 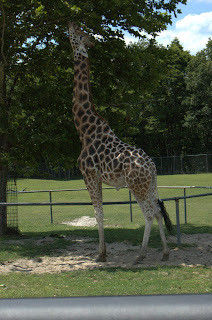 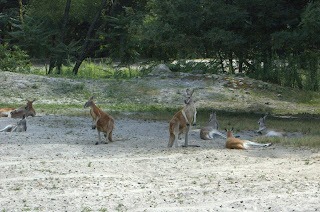 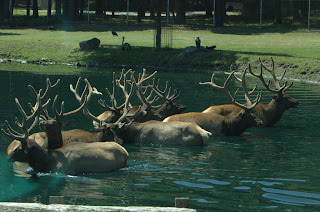 I am sharing some pictures that I took and here is the link to the Animal Safari. 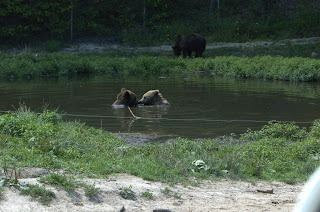 Please bear with the fact that some of the photos were taken with the car windows up, hence may not be that clear. 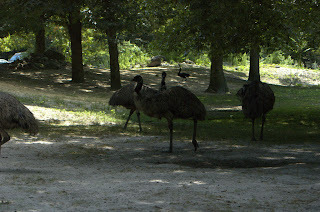 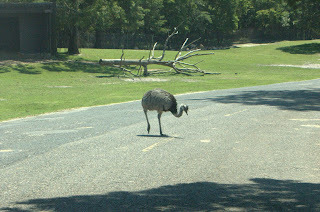 Looked like an ostrich, but was a Rhea!